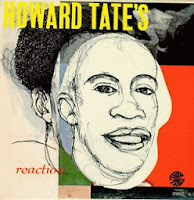 Howard Tate was an American soul singer. Howard Tate had scored some modest hits in the late 60s on Verve Records, working with producer Jerry Ragavoy. However he split with Ragavoy in 1969, and moved Lloyd Price's newly formed Turntable label. Here he had two more minor hits - "These Are The Things That Make Me Know You're Gone" and "My Soul's Got A Whole In It" made it to #28 and #31 on the R&B chart respectively. The album Howard Tate's Reaction came out in 1970, produced by Price and Johnny Nash. Most of the material was written by Price, though it also had a cover of Sam Cooke's "Chain Gang". It wasn't quite on the level of his superb Verve recordings, but nevertheless was some quality soul music, with Tate's voice on fine form.